DiVino Osteria Trevigiana is a typical restaurant in Treviso with a real exclusive design and a spectacular display of wines. Divino offer local and typical regional dishes, and it is ready to satisfy both international and Italian clients. The restaurant cooperate with Slow Food brand and include special products in its menu. Moreover is particularly accurate for little clients and celiac people. 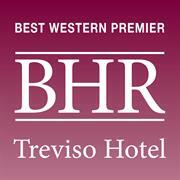 Divino is located inside BEST WESTERN PREMIER BHR Treviso Hotel and is open every day for lunch and dinner. The team is able to manage large gala events, cocktails, parties, weddings, anniversaries.